Insert the ShareChart Installation CD into the CD ROM drive and wait for a few seconds. The installation program should begin automatically. If it does not start then open Windows Explorer and click on the CD ROM drive. In the folder you will see the Setup program icon, double click on this icon. Once the installation program starts up, simply follow the on-screen installation instructions. To register, click on the Start Menu, then navigate to Programs > ShareChart. Then click on Register. 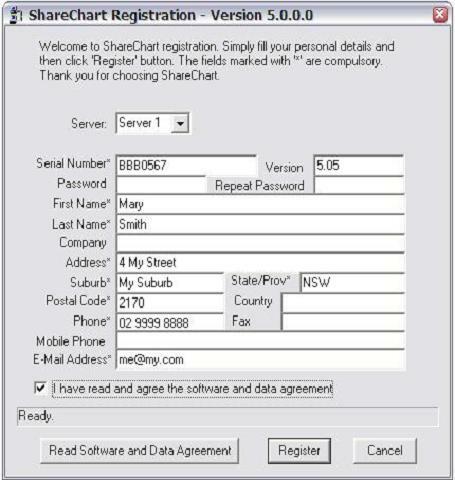 When the registration dialog box appears, fill in the detailed information required by the ShareChart registration program and click on the Register button. Please note that the registration and serial numbers are identical and are case sensitive. After successfully registering your copy of ShareChart you will be able to use it. However, we recommend that you download the current data before you attempt to view the charts. To download the latest data either go to Start > Programs > ShareChart and click on Data Download or click on the blue "NET" download button on the ShareChart toolbar. The downloading program will fill in the Date Range by checking for the missing dates. We suggest that you do not alter the date range unless it is necessary. Select the market you wish to download data for by using the Market Drop Down Box. The Downloader will automatically fill in the Date Range with the last day that data was downloaded and the most recent open market day. These dates should not be altered unless it is necessary. Click the Download button and ShareChart will begin downloading the data. This usually takes only a few minutes but is dependent on your Internet connection speed and the markets to which you have subscribed. For example, the U.S.A. market is much larger than the Australian and so will take a little longer. Once the data download is complete ShareChart will alert you by popping up the dialog box shown below. Just click the OK button to finish. Once the data download is complete then ShareChart will build the data index in order to update the charts. This takes only a minute and once done the charts will be up-to-date and ready to use. For accurate end of day Australia data and charts, you must download data after 7.30pm Sydney time (AEST).